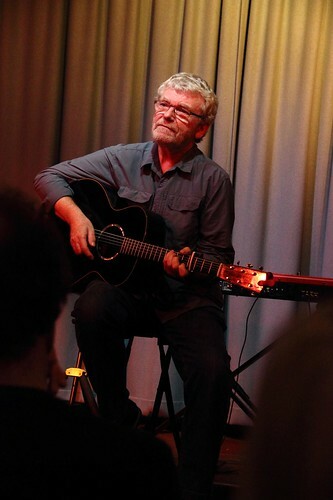 Absolutely delighted to announce that Pete Atkin will be playing two forty minute sets at The Watford Folk Club, Autumn 2013. No date yet....but it's definite! Everyone welcome, of course! More details as and when. Very Good to hear - but just one question ; who's that bloke Julian Mount who is playing there on the 31st of May? Singing or Juggling Julian? 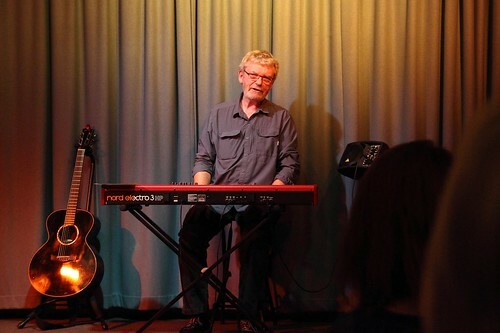 That bloke on 31 May at The Watford Folk Club is ME! Admission: £8 in advance. £10 on door. Want to reserve YOUR tickets now? October 25 is my birthday. Here's an interview with Pete in the Watford Observer. Rosy Moorhead previews the Watford Folk Club event. Don't be put off by the club's website, which currently states that some bloke called Pete Atkins is booked to play there on that very night. It's today already -- Friday! The club is laid out with theatre-style seating tonight due to demand, and I believe seats are still available in case you haven't already booked. Ten Pounds on the door; doors open 6:30, action starts at 8 p.m.. The Pumphouse is on Local Board Road on the edge of Watford town centre, WD17 2IP. Regret Carole and I can't make it as planned this time, but I'm sure we'll be missing a fine evening's entertainment. Pete plans to air one or two new songs. A great opportunity for anyone in the south-east of the country to catch our man in action! PS - Tonight's MC is MV member Julian Mount, a.k.a. Julian the Juggler. You mentioned you're intending to release a new album shortly, to which I look forward. If you are able to include the song 'The Way You Are With Me', I'll be especially glad. Sorry you didn't spot my (I thought) incredibly subtle bit of physical business designed to defuse the potentially overwhelming awe and reverence with which the audience naturally greeted my arrival on stage and to put them at their ease. Thank you for coming anyway. And to all the other MVs. 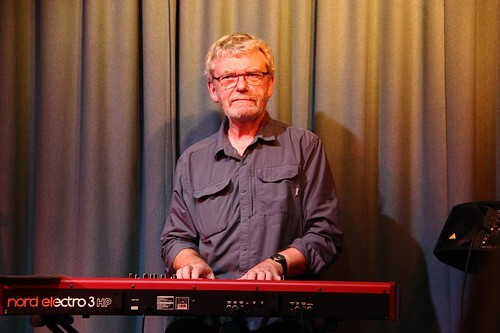 In introducing me, Julian asked any MVs in the audience to identify themselves and there was, it seemed to me, quite a substantial chorus of diffident grunts, so special thanks to all for making the effort, and not least to Julian for initiating the whole thing. I hop you ar wel I am. Yors sinserely, Pete. Julian the Juggler - book him for your next party and make sure to request "42 Dresses"! Anyway thanks very much to all concerned for an excellent gig. After navigating myself out of the audience for "A woman of no importance" which was in the theatre next door I located the Watford Folk Club! Looks like a good place to be a regular. As Sean says, Julian was an able MC, I think I last saw him juggling at Hebden Bridge. Good to see MVs Richard Whiting and Leslie Moss, there were quite a few others as well. Many of them well up to speed with the lyrics of the last number on the setlist. Leslie reminded me that there is a Midnight Voices presence on Facebook which is worth checking out, I can't quite lay my mouse on it at the moment to give the link. Pete was on good form and in good voice as ever. 2. The beautiful changes (g) I was struck again by the amazing lyrics to this one. 12. The closer someone is (k) This was the new one. A simple one, sad. Hope we hear it again soon. I think there were quite a few people in the audience who were new to the songs, you can always tell because they laugh at the jokes! To quote a rather obvious lyric from 'Star of Tomorrow': "We loved the way you fell." Really an excellent show during which I actually got to meet Pete for the first time (I'm way behind the curve on this). Particular highlights for me included 'The Beautiful Changes', 'Wristwatch for a Drummer' and 'Carnations on the Roof'. If I'd requested anything though, it would have been "new stuff", so delighted to hear three songs that were new to me, 'You'd Better Face it Boy', 'Cottonmouth' and 'The Closer Someone Is', the last of which is really quite lovely. "Remembering is no way to forget" is such a pure Clive James lyric it's surprising it hasn't cropped up before now. I'm also glad 'Empty Table', 'Dancing Master' and 'Hill of Little Shoes', being relatively recent songs, have found a firm place in the set. It's quite something hearing 'Hill' with an audience. At the end, no-one seemed to know whether to applaud or break down in tears. I should add I'm grateful to whoever requested 'Canoe' as it's one of the ones I always forget about, but absolutely incredible to hear live. I think everyone has "their" songs in the Pete Atkin repertoire, which must be challenging when people start shouting out requests, but goes to show how strong they all are. Oh, and one other thing. At the start, Pete said there were certain songs he couldn't really sing anymore as they were songs for "younger men", which I took to mean vocally dexterous or physically exhausting, but given that both 'Wristwatch' and 'Original Original Honky-Tonk Night Train Blues' were performed with aplomb (indeed, he sounded in fine voice throughout the evening) I can't imagine which songs he meant? Don't be put off by the club's website which currently states that some bloke called Pete Atkins is booked to play there on that very night. 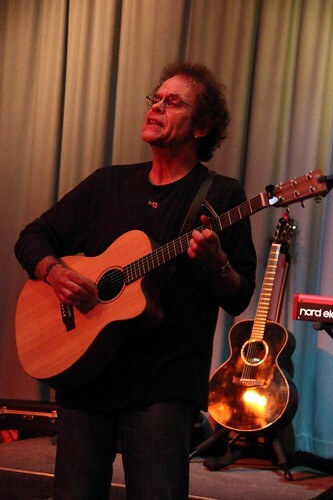 Felicitously there was a floor singer on Friday's bill at Watford Folk Club named Pete Nutkins. He probably gets really upset when they miss off the s! See also Mary Hopkin. She must despair. Hi Hannibal - Just to clarify, I think the comment you're referring to was about the fact that certain kinds of song could only have been written by a younger man, not that they can only be sung by a younger man. What I mean are songs like the OOHTNTB and Wristwatch for a Drummer, flashy songs, what I think of as 'show-off' songs. I still sing them, of course I do, not least because they have an immediate appeal for an audience, but technically it's much more difficult to make the simplest structures work. Just as, usually, if you ask people for their favourite rhymes they'll almost always come up with 'clever' or inventive, shiny or funny rhymes, when for my money there's often far more skill in less obviously clever rhyming. Clive's lyrics are full of examples of both kinds, of course. One of my favourite examples of his un-flashy (and therefore, I always feel, underrated) skill would be 'Me To Thank' (slated for the new CD), but there are many. Here is part of Pete's concert at Watford in 2013. As fans will know, part of the pleasure of Pete's gigs are his stories and expositions. So as not to spike his future shows, this film is for the most part just the songs. Get to a gig for the full PA experience! The technical quality is nothing to Viber home about (don't say I'm not up to date); but it's better than my last PA film which was made totally on a mobile phone. Maybe next time we might even manage stereo. Thanks for putting that up Paul - I really must make the effort to get to Hove in June!